Scallop is an edible bivalve mollusc meat which has a delicate slightly sweet flavor. It is valued not only for its taste but also for useful properties, which are due to the presence in its composition of a large number of minerals and vitamins. To cook the scallops simply, because they require minimal heat treatment. In Russia, rarely seen in the sale of fresh scallops – you can usually buy them only in frozen form. In the latter case, preference should be given to seafood in vacuum packaging, past the freezers. By weight scallops are a little cheaper, but the quality and taste of this product much worse. Before cooking scallops properly defrosted. To do this, you can leave them at room temperature or folded in a bag and placed in a container of cold water. In the latter case they will be unfrozen much quicker. It is important not to overdo them in water, otherwise it also has a negative impact on the product. After defrosting the scallops should be washed, dry and only then to cook. To cook scallops a variety of ways and with various ingredients. So, it turns out delicious this delicious, if you fry it in the pan. 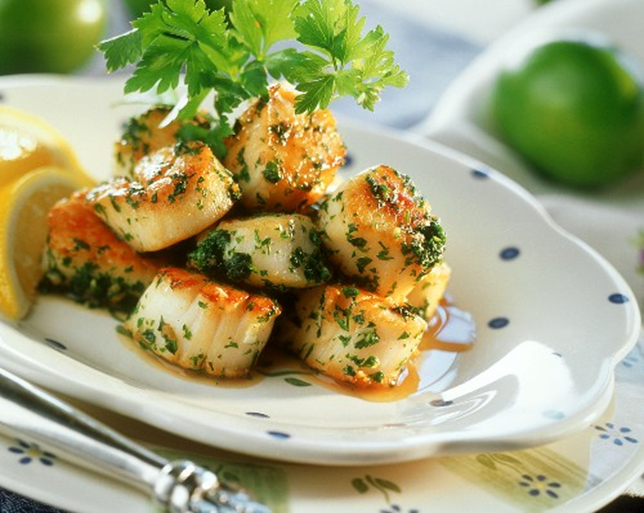 To add spice to this dish, scallops meat can be pre-marinated in olive oil, garlic and lemon juice. And half an hour later, sauté for 4 minutes in the pan. Serve this dish with asparagus or mashed potatoes. No less tasty scallops in the oven. To prepare, for example, more dietary dish, you can wrap them in foil, pre-sprinkled with salt, spices and watering lemon juice. You can also just put the product on a baking tray along with your favorite vegetables, drizzle with olive oil and send in the oven for 20 minutes. Grilled scallops also turn out juicy and tender. In this case, they do not require special marinade, but they can drizzle with olive oil so they don't dry, sprinkle with lemon juice, wine or soy sauce. Fry enough as long as they lose their transparency. Some gourmets like to eat scallops raw, seasoning them with salt, black pepper, lemon juice, olive oil. However thus it is necessary to eat the seafood only when you are sure of its quality. Or you can pre-marinate it in a mixture of salt, herbs, olive oil, balsamic or wine vinegar. Marinated scallops, by the way, can be used to prepare various salads. They go perfectly with rice noodles, peppers, bean sprouts, greens and a variety of seafood. As a dressing, use a mixture of ginger, sesame oil, sugar, lemon juice, garlic and olive oil.